Here you have 13 best portable toilets for camping that are currently available on the market, from the three major groups, waterless, flushable, and composting. All of them are reliable tools that have been on the market for several years already. Waterless portable camping toilets. Here you have removable waste bags, and this type is usually the most affordable and simple to use. Portable flushing toilets. The meaning should be obvious, you have water flushing systems here, more in the text below. These are a bit more expensive types. Composting portable toilets. This type uses no water or uses very little. The waste is mixed with some materials, like sawdust, and after that, it is disposed to turn into a fertilizer. These items are quite expensive. You will realize that the toilets presented here are well-engineered and reliable. Practically all of them have been on the market for a number of years already, so they have been tested by thousands of users. You realize this when you see how many customers’ reports are available on the Internet. Here, I do not discuss various chemicals that you might use to avoid odors, but those are widely available and some are mentioned in the videos below together with the toilets. If you still experience odors, then check the valve system which you have in the toilet, and also make sure that there are no objects blocking the seals from closing completely. I guess the meaning of the terminology should be self-evident, these are the simplest tools, some even nicely packable and can be carried in a suitcase. But why would you carry them this way? Well, there are countries where the toilets are just holes, so if you are not used to this, it can be very unpleasant experience with pain in your knees. Even in Japan, you can have super modern toilets with heated seats and water splash system to wash your bottom and then a fan that will make it dry; but next to it you can have an old-fashioned toilet with just a hole in the floor. This is the matter of tradition, and I have seen this in a brand new institute of physics which I have visited many times in the past. It was just built when I first visited it, and it still had both types described above. But in some other countries you can have only holes, so having a portable and collapsible toilet may be a wise way to go. Reliance Luggable Loo Portable Toilet. This is a simple design and this is one of the best selling items of this type on Amazon, with an impressive 4.6/5 average rating based on more than 1000 reports by customers. 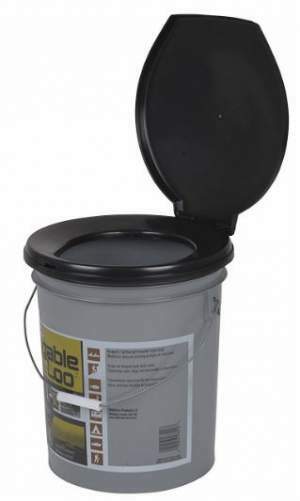 This is a very affordable, simple yet reliable portable toilet that will not break the bank. This bucket type toilet has a wide base and it is rather stable. As you realize, it will not sink into the ground. You have 5-gallon volume here, a hinged molded seat, and snap-on cover. I see it as a great tool for any outdoor activity with a car access, like family camping, fishing, hunting. To keep it clean, you will use any disposable plastic bags. This is a nice piece to have even at campgrounds which already have installed bathrooms, to avoid walking long distances, especially at night. The lid seals the bucket, and the whole structure looks like a normal bucket when you close the lid, all is self-contained and the waste is invisible from outside. Note that the seat is the same height as the Green Elephant model below, and it is higher than the Stansport toilet. I guess standards are different in different countries, but its height is the same what I have at home in the EU. The users’ weight limit in the specifications is 200 lb (91 kg) so this may be an issue with heavier people, bear this in mind. This limit is well below those you have in the Stansport and the Green Elephant toilet. The current price is $38. As for the basic data, the weight is 2.98 lb (1.35 kg) and the weight capacity is 200 lb (91 kg). The dimensions (L x W x H) are 13 x 13 x 15.56 inches (33 x 33 x 40 cm)..
Green Elephant Folding Commode Comfort Chair. This is a folding tool, the most practical and the simplest you will find. If you have very limited space in the car (or even in your travel suitcase), this is the tool to consider. You have a reinforced steel frame, which folds for transportation and packing. The seat is the size and the shape of a standard toilet seat. The principle of use is obvious from the picture. It will work with any plastic bag of the appropriate size (8 gallons). Note that the bag is kept in place by the double-layered seat. This steel structure supports up to 250 pounds (113 kg). The seat is a hard and dense plastic. This tool is perfect for hiking, hunting, safari, boating, construction sites, etc. One issue I notice here (except for the steep price) is the lack of the lid. This means you have to throw away the bag after every use. But I guess you would do this in any case, wouldn’t you? But if you would, then you can put any other plastic bag above and close the seat hole (till next use). And yes, certainly think of using black non-translucent bags. Yet another problem may be with its legs; they will sink into a soft ground so you have to think where to put it. Some other options shown in the list here do not have such a problem. The current price is $50. The weight is 3.5 lb (1.59 kg), the capacity is 250 lb (113 kg), and the height is 15.3 in (39 cm). 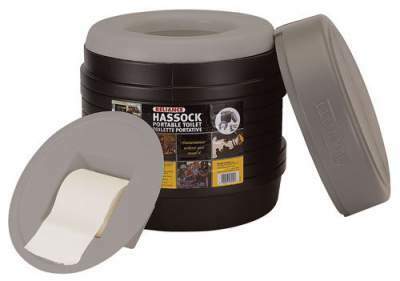 Reliance Hassock Portable Self-Contained Toilet. This is a very lightweight, portable, and completely self-contained toilet with a contoured seat and an inner splash cover which doubles as the toilet paper holder, see the picture. There is also a detachable and easy to empty inner bucket. Though the tool is rather bulky as you see from the picture, so this may not be the best option if you have lots of stuff in the car. 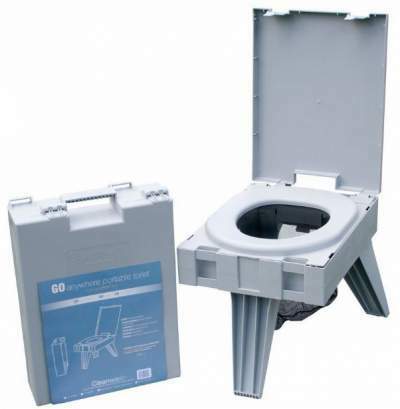 But this is a system similar to the Luggable Loo toilet above from the same brand, so the base is wide and the system is stable, it will not sink in the ground regardless where you put it. This is also a very affordable option, only $28 at the moment of writing this text. It is designed for camping and boating, and it comes with a five-year warranty against manufacturer’s defects. This is a rather affordable tool with the price $28. The basic data are as follows. The weight is 5 lb (2.27 kg), the capacity is 275 lb (125 kg), and the dimensions (L x W x H) are 14.7 x 14.7 x 14 in (37 x 37 x 36 cm). Cleanwaste Go Anywhere Portable Toilet in the packed and deployed state. This tool has been on the market for at least 7 years now, popular globally and for all good reasons. This is an incredibly well designed and very portable tool which looks like a briefcase when packed, with a built-in carry handle, see the picture. So this is one of the best options here when it comes to the issue of transportation. But it is impressive in many other ways, it weighs only 8 lb (3.6 kg), but it can be used by any sumo wrestler; its weight capacity is no less than 500 lb (227 kg). 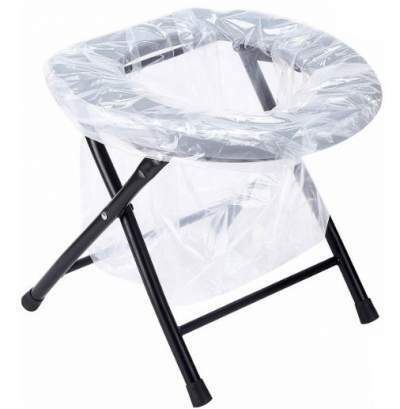 As you see in the picture, it is with three foldable legs, and the cover is removable and you can put it under the rear legs to prevent the toilet sinking in the ground. The system sets up in seconds, this is all about unfolding the legs which are locked in place when you unfold them one by one. You will see in the video that it contains a mesh holder which holds the plastic bag in place. The seat and bowl size dimensions are the same as of a standard home toilet. As of the moment of writing this text, the price is $66. The weight is 8 lb (3.6 kg) and it supports the user’s weight of 500 lb (227 kg). The dimensions (L x W x H) are 53 x 43 x 36 cm, and the packed size is 19 x 4 x 15 inches (48 x 10 x 38 cm). Stansport 273-100 Portable Camp Toilet. This is a very compact and elegant design with a comfy full-size seat and a thick lid which very efficiently contains odors. In fact, I know that some people who have no bathroom upstairs, use this during the night at home. This is a heavy-duty plastic construction which is able to support users’ weight up to 350 pounds (159 kg). So think about this option when you see the weight capacity of the Reliance Luggable model above. The tool is with some indentations (slots) on the sides below the rim so that you can carry it from place to place. It comes with one disposable sanitary bag so it is ready to use. Inside of the main body you have a small bucket where you would put the plastic bag, so it can be removed for emptying. The current price of this toilet is $60. It comes with a full-size seat and lid and a disposable waste bag. 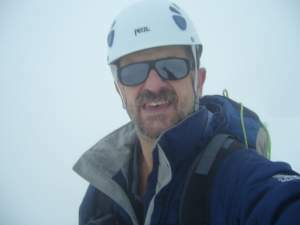 The weight is 9.2 lb (4.2 kg) and the maximum user’s weight is up to 350 lb (159 kg). The dimensions are 14 x 14 x 14 inches (35.5 x 35.5 x 35.5 cm). 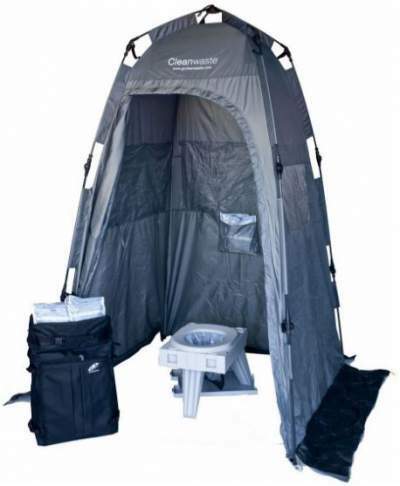 Cleanwaste Go Anywhere Total System – the privacy tent and the portable toilet. The packed system is also shown. You have already seen the Cleanwaste Go Anywhere Portable Toilet above, and here you have one important component added – a privacy shelter. So this is a complete system now which can be used for the toilet described above and as a shower as well. The toilet is the same and no need to describe it again, so a few words about the privacy shelter. This is an instant setup system. The meaning of this is that the poles are pre-attached to the shelter in the factory, so you just unfold it and open like an umbrella. if you are not familiar, there are huge instant family camping tents that work on the same principle. So you have a 3-in-1 tool and the privacy shelter can be set up in one minute by one person. You will see more details in the video below. This system is ideal for outside work, camping, military deployment, etc. 1 backpack that stores everything. The price of this tool starts from $138. Note that the toilet alone is $66, so this sounds like a reasonable price. The total weight is 18 lb (8.2 kg). The privacy shelter dimensions are 4 x 4 ft (122 x 122 cm), its height is 78 inches (198 cm) and the packed size is 28 x 6 in (71 x 15 in). This is a group of bulkier tools as you could have expected. But you will be surprised that their prices can be quite comparable with the much simpler waterless toilets shown above. When you see how they work you realize that there is a lot of technology and clever design in these flushing toilets. Although they look bulky, in fact, they are surprisingly lightweight when empty. The Camco model below is only around 5 kg (11 lb). One of the good things about this tool is the lever indicator which you have on the waste tank. It will turn red when it is full. This is what makes it different from several other models here in the list. This is a lightweight yet durable structure which weighs only 10.7 pounds (4.85 kg). 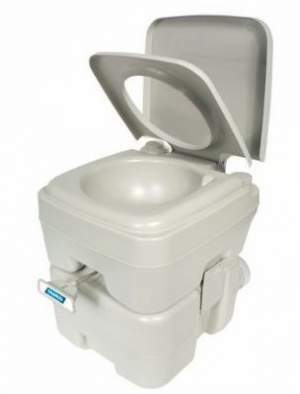 Thetford 92850 Porta Potti 320P Portable Toilet. The water tank is around 16 liters, and this is enough for around 33 flushes. The Thetford is a globally known brand and they have quite a number of items of this type on the market, this is why I have added the numbers 92850 and 320P in the title above. Releasing the waste tank is very easy and it is also very easy to empty it, you will see more in the video below. All in all, it is very compact, efficient, and an easy to use portable tool. The price of this toilet is $103. The basic data include the weight of 10.7 lb (4.85 kg), the dimensions (W x L) 16.5 x 15 in (42 x 38 cm), and the height 13.4 in (34 cm). The waste tank volume is 3.2 gallons (12 L), and the fresh water tank is 4.2 gallons (16 L). 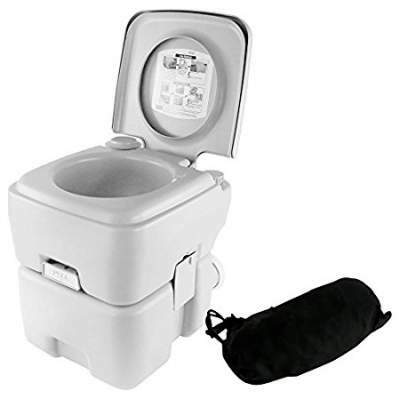 This is a very affordable portable toilet, its current price on Amazon is only $65 – 78 dependent on the size. It is built with two sizes waste containers, 2.6 and 5.3 gallons (9.8 and 20 liters). This affects their height so you have 11.5 and 15 inches (29 and 38 cm) for the two versions, respectively. Many will find the former too low. They both contain the same amount of flush water, 2.5 gallons (9.5 liters). Both toilets work on the same principle. Before using it, make sure you have filled the tank with water, you have an opening on the right. After you have done your “private job”, you have a handle below on the front (see the picture), so pull it and the waste will pass into the container below. Then press the pump on the left to splash the toilet. When the waste tank becomes full, you detach the upper part, and on the back of the rank you have a cap which you unscrew and empty the tank. The tank is with a handle on the side so carrying it should not be a problem. This is an enormously popular portable toilet and there are more than 940 customers reports on Amazon alone. The average rating is 4.3/5. Camco has a great reputation and a good customer’s support service, so it is not surprising that their models are so popular. The thing that is missing is the level indicator for the waste container. The weight is 9.4 lb (4.3 kg) and 10.8 lb (4.9 kg), and the dimensions are (L x W) 14 x 16 in (36 x 41 cm). The height of the two models is 11.5 in (29 cm) and 15 in (38 cm). Camco Premium 41545 flushing toilet. This refers to the waste holding tanks. Now, the obvious consequence of this is their height. So the former is 12.5 inches (32 cm) high and the latter is 16 inches (40.6 cm) high. This may be important for some people, a too low seat is not always so convenient, so bear this in mind. Both versions contain 3.75 Gallons (14 L) of water. This is a great design, and probably the closest you can get to your home comfort when you are on a camping tour. The structure is very stable and bulky, but it still needs some care when the fresh water tank is full and the waste container is empty. This is because the fresh water tank is in the upper section so the top area is heavier than the bottom. So just try to put it in a stable position when transporting it in the car. There are more than 940 customer’s reports about the Camco 41545 on Amazon, and the average rating is exceptionally high 4.3/5. The missing thing here is the same as in the other Camco model above, the level indicator for the waste container. The current price is $82. The weight when empty of the taller toilet is 11.5 lb (5.2 kg), and of the lower toilet is 11 lb (5 kg). The dimensions for both toilets (W x D) are 16 x 17 in (41 x 43 cm). 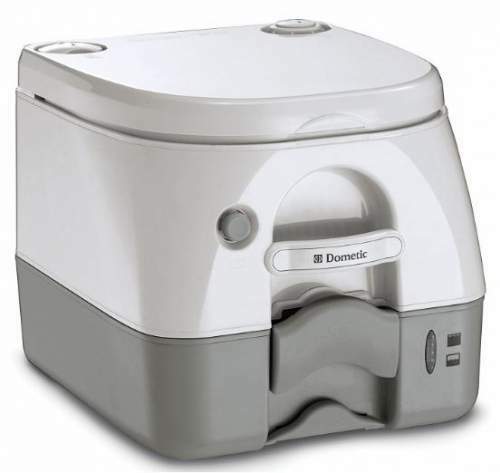 Dometic 301097206 Portable Toilet 2.6 Gallon. 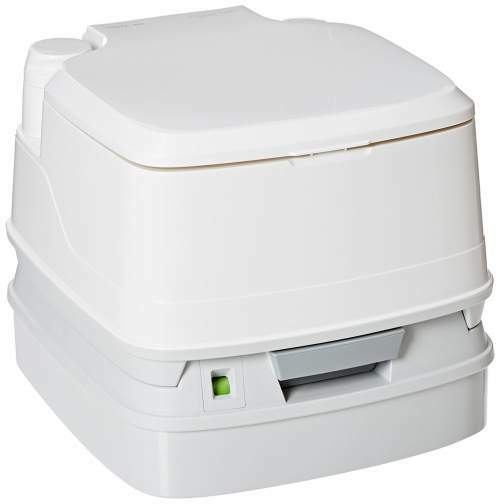 This Dometic 972 Portable Toilet is a very durable structure with several great features. This is a high-density polyethylene (HDPE) construction and this material is known for its toughness and high strength to density ratio. You can drop it and stand on it, and it will take it. You have an attractive scratch-resistant matte finish, and it is easy to keep clean. 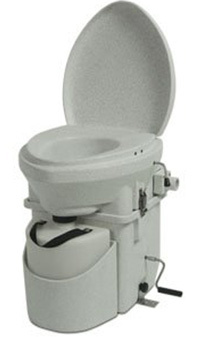 It features an adult-size seat and a powerful push-button which makes a pressurized flush. One particular feature which I love here is its prismatic tank level indicator. The waste holding tank is 2.6 gallons (9.8 liters) and in the video below you will see how to use the toilet and how to empty the tank. It has holding handles for both freshwater tank and for the waste tank. The current price is $94. The basic data include the weight 12 lb (5.4 kg), the dimensions (W x D) 13.8 x 15.25 in (35 x 39 cm), and the height 12.5 in (32 cm). The freshwater tank volume is 2.3 gallons (8.7 L). 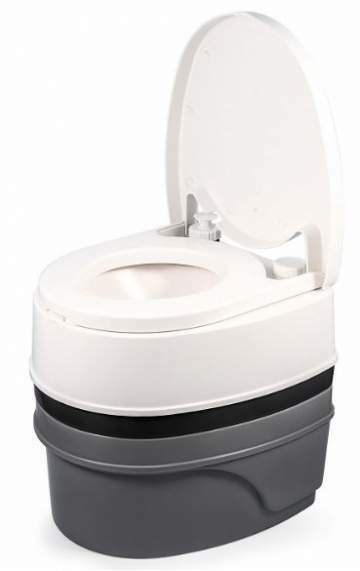 This SereneLife SLCATL120 portable toilet comes with a tank for fresh water with 3.2 gallons capacity, which is enough for 50 times flushing. The waste container is huge 5.3 gallons, so you will not have to empty it very frequently. If you compare it with other models above you will see that it is the largest regarding the capacity. They describe it as ideal for general travel, camping, picnicking, hiking, farming, RVs, etc. So indeed it is very versatile, but the same holds for the models presented above. It is a corrosion resistant, rugged, and durable construction and this is reflected in its weight; as you realize it is slightly heavier than the models above. You have a double-sealed drain valve to avoid leaks and odors, and the access to the waste tank is easy. The current price is $80. The other data are as follows. The weight is 13 lb (5.9 kg), the dimensions (L x W) are 16.5 x 14.6 in (42 x 37 cm), and the height is 16.9 in (43 cm). The waste tank capacity is 5.3 gallons (20 L), and the fresh water tank capacity is 3.2 gallons (12 L). This is a really special design, suitable for RVs, small boats, and for camping. They are much more expensive than the models you have seen above, and they need no plumbing which you would need in conventional toilets. This is a type that uses no, or very little, water. This because the waste is mixed with peat moss or sawdust, and it is transformed into a fertilizer, similar to the garden waste in your garden composter, just the composting stuff is different. You need a vent system so that the liquid evaporates. The resulting compost is safe to handle. If used permanently in a closed space, you attach the toilet to the floor to secure the toilet in place. They have a pipe to vent the gasses and odors, so you make sure that it has access to the open air. The fan is needed to help moisture evaporation and this is practically all you need for such a system to work. When the moment comes to empty the toilet you will realize that the unpleasant odors have dissipated, you will “see” this in the video below. The types of the composting toilet presented below are self-contained, which means that the composting unit is the part of the toilet. Such tools reduce water consumption and therefore the disposal of wastewater, they have low power consumption, and there is no need for transportation of wastes. Nature’s Head Dry Composting Toilet with Standard Crank Handle. So this is one of the composting toilets included in my list, there is yet another from the same brand below. This was originally designed with the idea of having an off-grid system that would be user-friendly and environment-friendly. It is nicely built, easy to use, and this is a reliable tool in general. Lightweight yet durable, this is a tool that will serve you for years. The great thing is the lack of smell, and this holds for both the toilet and the compost product. You have seen a video above with a blindfolded guy who smells only “soil”. The word “dry” in the name suggests that the toilet separates liquid waste into a different container which you will empty when it gets full. The rest in the waste container is with a minimum moisture level needed for composting to take place. This tool comes at a price, but this is the leading brand and the tool is reliable. If you look around you will realize that this toilet has received very positive reports from users. The average rating on Amazon is an impressive 4.3/5. The price is steep here, $940. The weight is 27.2 lb (12.3 kg), and the dimensions are 19.8 x 20.8 x 20.5 in (50 x 53 x 52 cm). Nature’s Head Self Contained Composting Toilet. 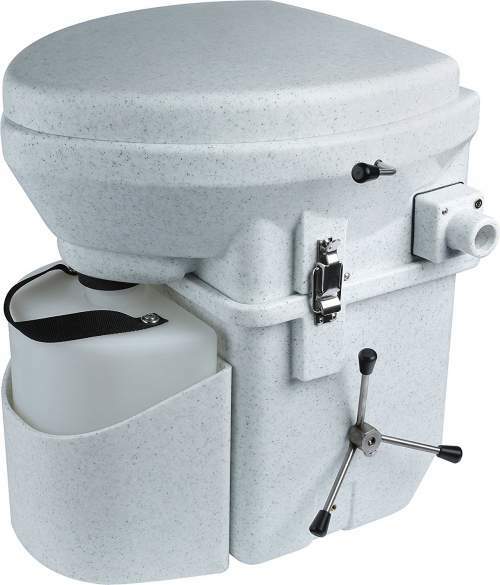 This is a compact and self-contained toilet with an elongated and comfortable seat. When you start using it, put 2 gallons of peat moss in the waste container. After you use the toilet, mix the content inside with the handle you have on the side. It is equipped with a vent pipe and a fan that works on 12 V.
It is designed to be used in a marine environment and practically anywhere, like on RVs or campers, in vacation cabins, workshops, barns, yurts, and trucks. This is a rugged design and materials (all stainless hardware) it has been proven to be extremely durable. The urine is largely separated into its 2.2 gallons (8.3 L) container and if used by two people, you might need to empty it every two days depending on the use. As for the solids, you can speak about emptying it after 50 – 80 uses; so for two people this could mean one month. But the bowl should be cleaned so use just a spray bottle and brush. The idea is to make the compost without chemicals. The toilet has been tested up to 500 lb (227 kg). Note that composting only works in warm temperatures, ideally 55 F (13 C) and above. This is again an expensive too with the price rag $960. The weight is 28 lb (12.7 kg), the length is 48.3 cm. The width is 48.3 cm or 58.3 cm dependent on the handle, and the seat height is 50.8 cm. There isn’t any toilet here which could be called the best. This depends on what you need, and the list presented here is to help you make an educated choice. Perhaps you do not know, but during the WWII, the outcome of the huge battles in North Africa was at least partly affected by the waste disposal. English used wooden ammunition boxes and made holes in them and used them as toilets; then they would cover them with some cotton bags to prevent flies from going there and spreading the waste around. This helped in avoiding stomach illnesses and dysentery which did a lot of damage to the opposite German side. So the disposal of waste and emptying of toilets is an important issue. The waterless tools are good because of the obvious clean way of dealing with waste, and it is even better if you use biodegradable sacks. They sometimes come with a powder that turns liquid waste to solids. So bury them deep enough and not close to any water source. Use also rapidly disintegrating toilet paper. The toilets with water flush systems are convenient in regulated places where you can empty them, otherwise emptying them can become problematic because of possible restrictions. The waterless toilets have some obvious advantages; there is no real cleaning here, you just need new disposal bags. For flush toilets, you will need some deodorizer or cleaning agent. So have a look around and read included instructions to see what may be most appropriate. Sometimes you will have some samples included in the package. You have seen one example above (the Cleanwaste GO Anywhere Total Toilet System) where the problem of privacy is solved; you have the privacy tent/shelter included. As you see some of them can be with two rooms. They are functional and multi-purpose and can be used as shower shelters in the camp, you will need them if such a facility is not available. So this was my selection of the best portable toilets for camping that are currently available on the market. You have plenty of options within the three major groups. The flushable toilets from the second group can be really affordable, bearing in mind that these are quite sophisticated structures as compared with the waterless models. If you need a privacy shelter for such a portable toilet, please check my text with some great options. Thank you for reading. Please let me know if you have any question or comment, there is a comment box below. Have a nice day. It’s encouraging to see the newer entrants like the Camco Travel Toilet and the Natur’e Head’s toilet stretching beyond the limit. A few year ago we used to have very few reliable brands of camping toilets; but despite the fact the number of campers worldwide remains more or less constant over the years, the camping potties seem to grow in popularity hence the increased innovation. Personally I would love to see improvements in terms of weight, because those who never camp in RVs will more often than not find the portable flush toilets a bit of a bulk. That means a majority of campers are left with a limited choice of the seat-type that require doodie bags; something a majority of people are not used to at home. Thank you for commenting Daniel. I shall do some research to see about what you suggest regarding the weight, currently they all are in the same weight range around 5 kg. But I would not expect big changes soon regarding the hulk, I mean in the flush toilets group, they have to have some basic elements that are bulky by nature, unless some truly smart models appear. The list will be updated, these items are very popular. But a comment about the number of campers. It seems it is growing in the US by 1 million per year, at least due to some sources. Also, the number of RVs is growing both in the US and in EU. So there will be more of these portable toilets on the market. Thanks for pointing out that there must be a deodorizer or cleaning agent to ensure that the toilet will be clean. I will keep that in mind to put some in the portable restrooms that I will be having for the event next week. We just need them because the venue has limited restrooms while we have lots of guests. Thank you Millie and most welcome. Yes, it is indeed so, these tools operate with a limited amount of water and some even without it as you have seen. It helped a lot when you mentioned how waterless portable toilets are some of the more cheap options. I can see how anyone looking into this would want to look at all the available toilets in their area and choose one that can suit their needs best. Personally, I would also want to check the number of people that will be at my event before choosing a portable toilet. Sure, I agree with you. I see them primarily as personal items and for family members. In the case of those waterless, if used by many people, I guess the best way would be to use each bag individually and remove after the job is done so that the seat remains ready and clean for another user. I want to make sure that I’m able to use the bathroom on my camping trip. It makes sense that bringing a portable toilet would be beneficial! That seems like a great way to ensure that I have all the facilities I need. Thank you Braden, it is as you said it nicely. When Nature calls we have no choice, so it is just the matter of deciding how and where. You can’t deny the call of nature and it becomes the most annoying fact when you are on an outdoor trip. So what you need a permanent solution for those days. I think “Camco 41541 portable toilet” is Comfortable and standard outdoor visit like adventure sports, camping tent, picnic or other recreational activities. Many thanks JMK, great to hear from you and good to see that you agree about the Camco 41541 which I have included in the list.